Mint Clinic Scaling and root debridement in Mint Clinic - find out if you need it. Scaling and root debridement as it is technically known is a conservative and many times, a very effective form of treatment for gum disease. Especially in the early stages of gum disease, like gingivitis, scaling and root debridement, along with an evaluation of contributing health factors, may be all that is needed to get the disease under control. 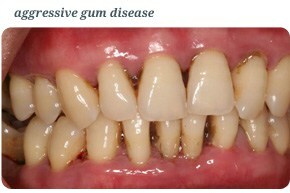 With more advanced gum disease, this would be the preparatory phase or initial therapy. Depending on the response to this treatment, we will maybe indicate further corrective surgical treatment. Scaling is the removal of calculus (tartar) and plaque from the tooth. Gum disease is particularly a problem when the calculus (tartar) gets below the gum on the root surface where you can no longer clean it. It becomes a haven for pathogens which are harmful. Special ultrasonic scalers can initially break down the hard calculus. Then, we use special hand-held instruments like scalers and curettes for fine scaling. Bacteria are more likely to stick to the rough surfaces (the root). The root surface is smoothed in a process called root debridement. This helps removes any remaining calculus or “contaminated” cementum on the root and leaves the surface less susceptible to the bacteria. If you have gingivitis or periodontitis that is localised to one part of your mouth, scaling and root debridement can be done in just that area. However, if you have a more generalised form of periodontitis spreading throughout your mouth, your dentist typically will do a quarter(a quadrant) or half of the mouth at one time. This means that two to four visits may be necessary to complete the scaling and root debridement. For some patients, scaling and root debridement is uncomfortable without the area being numbed. Generally the dentist will numb the portion of the mouth. For two to three days after the treatment, you may have some tenderness and increased sensitivity to hot and cold temperatures, so you will want to avoid any drastic temperature deviations. To treat tenderness, warm salt water rinses or a special rinse eg. Chlorhexedine recommended by your dentist will be very helpful. We would recommend to take painkillers (whichever you find most effective) 1 hr before and again 4-6 hours later. For most patients, scaling and root debridement could be uncomfortable. We will numb the portion of the mouth and also recommend taking 2 painkillers (whichever you find most effective) 1 hour before treatment. For nervous patients, there is the option of sedation either oral or I.V. For two to three days after the treatment, you may have some tenderness and increased sensitivity to hot and cold temperatures, so you will want to avoid any temperature deviations. To treat tenderness, warm salt water rinses or a special rinse eg. Chlorhexedine will be very helpful. We would recommend to take painkillers (whichever you find most effective) 1 hour before and again 4-6 hours later. Any time the oral soft and hard tissues are manipulated, there is always a possibility and risk of unexpected and undesirable side effects. Each individual is unique and these complications. Sympthoms you may experience: post-surgical infection, swelling, bleeding, headache, TMJ joint pain, tooth/gum pain, tooth sensitivity to hot, cold, sweets, shrinkage of gum tissues, muscle soreness. While in most cases transient, some will require further treatment. Please ask if you are unsure as to any of these effects. It is important to note here that certain conditions, nerve damage, infections, tooth trauma,etc may have pre-existed in a tooth as an asymptomatic, chronic state. Dental procedures in general can sometimes turn these states in a tooth to an acute one. Therefore complications that sometimes arise in teeth after any type of dental / gum treatment may not have occurred as a direct result of the periodontal treatment. Our passion is the maintenance of a healthy gum condition for as long as possible. We are delighted when our patients attend years after their initial treatment for review and their condition is stable. However a percentage of patients will experience a gradual loss of teeth. It is difficult to predict exactly when this will happen. However by monitoring your condition over a period of time we are able to estimate this with a greater degree of accuracy. This information is very important; it will allow your dentist to anticipate your future treatment need. We didn’t enhance this photo and we have patients permission to use it. The treatment we provide can stabilise your condition and prevent immediate tooth loss. Many studies have shown that provided patients demonstrate meticulous oral hygiene and regular maintenance that even teeth with a poor prognosis can last for many years. Keeping your natural teeth for a lifetime! For complete payment terms please see our fee guide. To book an appointment please email us or tel: (01) 678 9904. Thanks for the excellent job you did! Not only has the denture corrected my smile, but the fit is also perfect (no, pressing or scraping) in the mouth. A special thanks too for your sensitiveness, you didn’t try to “press” me to a maximum treatment, but could accept what I felt as my optimum.